The right to play and informal recreation, for all children and young people up to 18 years of age is contained in Article 31 of the United Nations Convention on the Rights of the Child. No Australian would deny this right for our children, but how well does this translate into practice in the 21st century and could we do better? 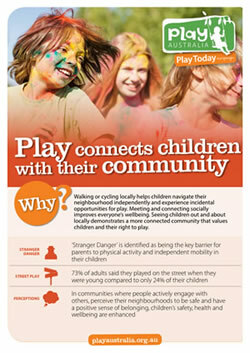 Play Australia advocates for healthy play opportunities for children, young people and the wider community. Our ‘Play Today’ campaign provides information to the play sector and wider community on the importance of play for children’s health and wellbeing. We have developed a series of 5 factsheets covering a number of current topics about the issues children face - complete with information, definitions and data. 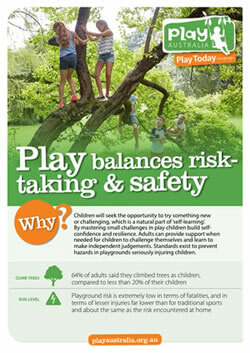 There are also helpful tips on how parents, educators and caregivers can support play. You can access this resource by simply downloading the A4 factsheets to print, display or distribute to your organization, network or group. 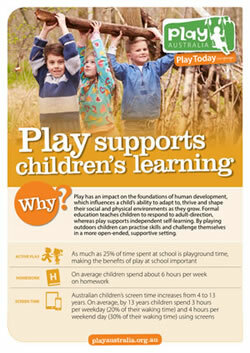 Better opportunities for play means healthier children and a healthier Australia. Click links below to read and/or download each of the factsheets in High Res PDF files.